Anthrax is an infectious disease caused by the bacterium Bacillus anthracis and is spread by contact with the spores of the bacteria, which are often from infectious animal products. Contact is by breathing, eating, or through an area of broken skin. There are 3 main routes of anthrax infection: cutaneous, inhalation, and gastrointestinal. Symptoms of cutaneous anthrax includes a small blister with surrounding swelling that often turns into a painless ulcer with a black center. Symptoms of inhalation anthrax begin with fever, headache, cough and shortness of breath. Symptoms of gastrointestinal anthrax usually include nausea, vomiting, diarrhea, or abdominal pain. The tests to diagnose anthrax are rapid diagnostic techniques such as polymerase chain reaction-based assays and immunofluorescence microscopy. Antibiotics are usually used to treat anthrax which includes penicillin, doxycycline, and ciprofloxacin. The anthrax vaccine is recommended for people who are at high risk and two months of antibiotics, such as doxycycline or ciprofloxacin, after exposure can also prevent infection. 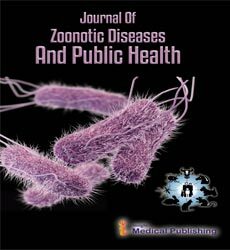 Journal of Community Medicine & Health Education, Journal of Nursing & Care, Primary Healthcare: Open Access, Importance of Zoonoses in Public Health, Journal of Foodborne and Zoonotic Diseases.